The highly anticipated Dell XPS 15 (9570) could feature a discrete Max-Q GPU. This was confirmed by Dell's Frank Azor in reply to a question asked on Twitter. Azor, however, did not reveal what the exact GPU is but expect to see a GTX 1050 Ti Max-Q at the minimum. The next iteration of the highly anticipated Dell XPS 15, the XPS 15 9570, is expected to be announced shortly and while leaks have been few and far between, we just got to know about another important aspect of the prosumer multimedia notebook. Responding to a query on Twitter, Dell's VP General Manager of Alienware, Gaming and XPS, Frank Azor replied that the XPS 15 9570 will feature a Max-Q GPU. While he did not go into any specifics of what the GPU would be, it can be predicted with a fair degree of certainty that it has to be a GTX 1050 Ti Max-Q. Simple. Lower power draws for thin laptops. Going by the new XPS 13 and the XPS 15 (2-in-1) 9575 featured at CES 2018, the vanilla XPS 15 is also expected to shed some weight and thickness making an already thin and light notebook even more portable. The XPS 15 9560 featured a GTX 1050 so it is obvious that the successor would feature a slightly more powerful GPU but the reduced thickness can complicate the thermals resulting in excessive throttling. Therefore, it makes sense to go for a Max-Q design in such a case to alleviate some of the throttling concerns. NVIDIA Max-Q GPUs are rated at TDPs ranging between 34 to 46W with about a 10-15% performance hit compared to their non-Max-Q counterparts. The Max-Q implementation also helps brings down the fan noise level to 40 dBA making it on par with that of the XPS 15 (2-in-1) 9570. From the looks of it, the GTX 1050 Ti Max-Q seems to be most probable option. Azor had earlier denied the possibility of a GTX 1060 Max-Q. The implementation of the GTX 1050 Ti Max-Q also brings the GPU performance inline with the integrated Radeon RX Vega M GL in the XPS 15 (2-in-1). Additionally, surface temperatures can be kept under check with the help of the new GORE thermal insulation. There are not too many specifics available at this point. 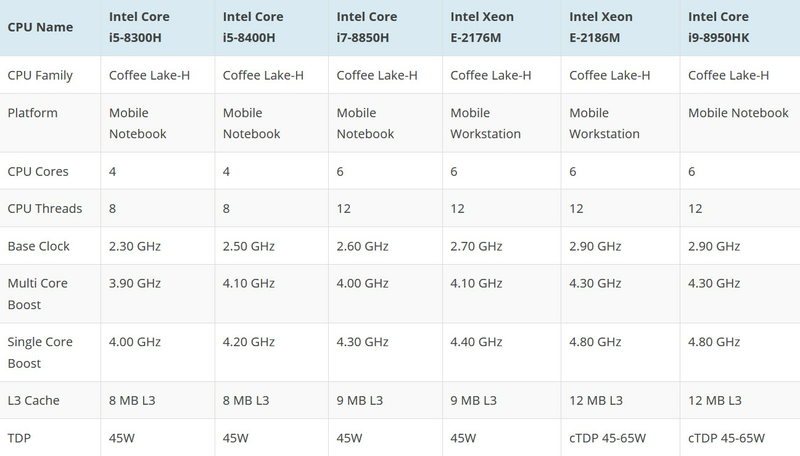 Rest assured, the XPS 15 9570 will feature an 8th generation hexa-core Intel 'Coffee Lake' H CPU. Frank Azor himself had confirmed earlier that they were waiting for Intel to ship the 8th generation H parts. The options could range from the Core i5-8300H to the Core i7-8850H offerings that fall in the 45W TDP range. The unlocked Core i9-8950HK is also a theoretical possibility but don't get your hopes high on that as the purported base performance gains over the Core i7 offerings would be in single digit percentages at best. RAM will top out at 32 GB similar to the XPS 15 9560 and Azor confirmed that there will not be a 64 GB option. We also know that 4 lane Thunderbolt 3 (TB 3) ports are a given in this generation. Dell received a lot of flak for the inclusion of a gimped 2 lane TB 3 setup in the XPS 15 9560. While we've seen that external displays make do just fine with a 2 lane TB3 setup for gaming, the availability of full PCIe bandwidth between the TB 3 port and the CPU will enable more peripheral connectivity and possibly higher frame rates while gaming on the internal display. On the other hand, expect to see dwindling numbers or shunning of legacy USB ports for USB 3.1 Type-C and swapping the standard SD card slot with microSD similar to what we've seen with the new XPS 13 and the XPS 15 (2-in-1). Dell also hinted at the possibility of the XPS 15 9570 featuring a 5K display option but the chances seem somewhat slim, and frankly, an overkill for a 15-inch screen. The XPS 15 9560 was one of our suggestions for the 10 best multimedia notebooks for 2017 and from what we've seen so far, the upcoming XPS 15 9570 will likely continue its predecessor's legacy of a great prosumer multimedia notebook that can also game. The upgraded internals should ensure that its multimedia prowess is not hindered and while a lower-end MaxQ GPU is not the most ideal choice for sustained high resolution gaming, it does bode well for great multimedia performance — and that is the raison d'être for this notebook.